Stirring gently, pour all ingredients into highball glass. Garnish. A Bloody Mary is a cocktail containing vodka, tomato juice, and combinations of other spices and flavorings including Worcestershire sauce, hot sauces, garlic, herbs, horseradish, celery, olives, salt, black pepper, lemon juice, lime juice and/or celery salt. In the United States, it is usually consumed in the morning or early afternoon, and is popular as a hangover cure. The Bloody Mary was invented in the 1920s or 1930s; there are various theories as to the origin of the drink, as well as the origin of its name. It has many variants, most notably the Red Snapper, the Virgin Mary, the Caesar, and the michelada. Fernand Petiot claimed to have invented the Bloody Mary in 1921, well before any of the later claims, according to his grand-daughter. He was working at the New York Bar in Paris at the time, which later became Harry's New York Bar, a frequent Paris hangout for Ernest Hemingway and other American migrants. The original cocktail is said to have been created on the spur-of-the-moment, according to the bar's own traditions, consisting only of vodka and tomato juice. Harry's Bar also claims to have created numerous other classic cocktails, including the White Lady and the Side Car. "I initiated the Bloody Mary of today," he told us. "Jessel said he created it, but it was really nothing but vodka and tomato juice when I took it over. I cover the bottom of the shaker with four large dashes of salt, two dashes of black pepper, two dashes of cayenne pepper, and a layer of Worcestershire sauce; I then add a dash of lemon juice and some cracked ice, put in two ounces of vodka and two ounces of thick tomato juice, shake, strain, and pour. We serve a hundred to a hundred and fifty Bloody Marys a day here in the King Cole Room and in the other restaurants and the banquet rooms." The cocktail was claimed as a new cocktail under the name "Red Hammer" in Life magazine in 1942, consisting of tomato juice, vodka, and lemon juice. Less than a month later in the same magazine, an advertisement for French's Worcestershire Sauce suggested that it be added to a virgin "Tomato Juice Cocktail" along with tomato juice, salt, and pepper. The addition of salt to the alcoholic beverage was suggested that same year in a story in Hearst's International Combined with Cosmopolitan. The name "Bloody Mary" is associated with a number of historical figures—particularly Queen Mary I of England, who was nicknamed as such in Foxe's Book of Martyrs for attempting to re-establish the Catholic Church in England—and fictional women from folklore. Some drink aficionados believe the inspiration for the name was Hollywood star Mary Pickford. Others trace the name to a waitress named Mary who worked at a Chicago bar called the Bucket of Blood. The tradition at Harry's New York Bar in Paris, according to manager Alain Da Silva in a 2011 interview, is that one of the patrons for whom the cocktail was first mixed in 1920 or 1921 declared, "It looks like my girlfriend who I met in a cabaret"; the cabaret's name was the Bucket of Blood and the girlfriend's name was Mary, so the patrons and bartender "Pete" Petiot agreed to call it a "Bloody Mary". Yet another suggested origin of "Bloody Mary" is that the name in English simply arose from "a failure to pronounce the Slav syllables of a drink called Vladimir", which gains some credibility from the anecdotal observation that the customer at The New York Bar for whom Fernand Petiot prepared the drink in 1920/21 was Vladimir Smirnov, of the Smirnoff vodka family. 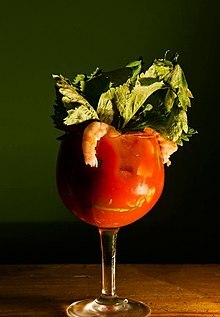 In the United States, the Bloody Mary is a common "hair of the dog" drink, reputed to cure hangovers with its combination of a heavy vegetable base (to settle the stomach), salt (to replenish lost electrolytes), and alcohol (to relieve head and body aches). Bloody Mary enthusiasts enjoy some relief from the numbing effects of the alcohol, as well as the placebo effect. Its reputation as a restorative beverage contributes to the popularity of the Bloody Mary in the morning and early afternoon, especially at brunches. The drink is traditionally served over ice in a tall glass, such as a highball, flared pint or hurricane glass. The two critical ingredients, vodka and tomato juice, are relatively simple; however, the drink almost never consists of these two ingredients alone. Among the more common additions to the juice base are salt or celery salt (either mixed in or as a salted rim), cracked pepper, hot sauce (such as Tabasco), citrus juices (especially lemon or lime), Worcestershire sauce, celery seed, horseradish, clam juice or olive brine, brown sugar or molasses, and/or bitters. Some or all of these ingredients can come pre-mixed with the tomato juice as a single "Bloody Mary mix" to which the vodka is added, or the drink may be hand-constructed by the bartender from raw ingredients according to the patron's preference. A common garnish is a celery stalk when served in a tall glass; other common garnishes include olives, cheese cubes, a dill pickle spear, lemon wedges, dried sausage, and/or shrimp (as the taste of the drink is often reminiscent of shrimp cocktail sauce). There is a considerable amount of variation available in the drink's construction and presentation including the use of different base spirits like bourbon, rye, tequila, or gin. Gin is often preferred in the UK, sometimes called a Red Snapper (although this name is also used for other variants), or Ruddy Mary. In addition to the aforementioned more traditional ingredients, practically anything can be added to the drink itself or as a garnish according to the drinker's wishes or the bartender's or establishment's traditions. Some variations of the Bloody Mary served by restaurants are designed to be a meal as well as a drink, coming with massive "garnishes" on skewers inserted into the glass, including ribs, miniature hamburgers called "sliders", grilled or fried shrimp, kebabs, sandwich wedges, fruit slices, and even sashimi. The drink itself can be served in any of a variety of glasses, from wine glasses to schooners or beer steins, according to tradition or availability. It is a tradition in the upper Midwest, particularly in Wisconsin, to serve a Bloody Mary with a small beer chaser. A Virgin Mary, also known as a "Bloody Virgin" or "Bloody Shame" (the latter especially in Australia) is a non-alcoholic cocktail, generally using the same ingredients and garnish as a Bloody Mary (according to local custom), but with the spirits replaced by additional tomato juice or prepared mix. ^ Sutcliffe, Theodora. "Fernand Petiot". Difford's Guide. Odd Firm of Sin Ltd. Retrieved 9 November 2017. ^ MacElhone, Andrew & MacElhone, Duncan (1996) . Harry's ABC of Mixing Cocktails. Souvenir Press. p. 35. ISBN 0-285-63358-9. ^ a b Chazan, David (25 November 2011). "A century of Harry's Bar in Paris". BBC News. BBC. Retrieved 9 November 2017. The story is that there were a few customers, a few friends, and the bartender, Pete [sic] Petiot, made a cocktail for them with tomato juice and vodka. ^ Smith, Andrew F. (2007). The Oxford Companion to American Food and Drink. New York: Oxford University Press, Inc. p. 55. ^ Lucius Beebe (December 2, 1939). "George Jessel's newest pick-me-up which is receiving attention from the town's paragraphers is called Bloody Mary". New York Herald Tribune. p. 9. ^ "King Cole Bar: The History Of The Red Snapper". The St. Regis New York. Marriott International, Inc. Retrieved 9 November 2017. ^ Park, Michael Y. (1 December 2008). "Happy Birthday, Bloody Mary!". Epicurious. Retrieved 11 July 2011. ^ "Hollywood goes Russian". Life magazine. 13 (8): 38. 1942. 'Red Hammer' is a new Hollywood cocktail. Helene Reynolds mixes one for Bob Turner at her party. It is part tomato juice and part vodka, with a dash of lemon. ^ LIFE. Time Inc. 5 October 1942. Retrieved 15 April 2014. ^ "Potent pick-me-up". Chicago Tribune. 24 July 2002. Retrieved 1 May 2012. ^ Leigh Fermor, Patrick (November 1, 1976). "Auberon Herbert". In Joliffe, John (ed.). Auberon Herbert: A Composite Portrait. Michael Russell. ISBN 978-0859550482. Cited in Leigh Fermor, Patrick (2003). Cooper, Artemis (ed.). Words of Mercury. John Murray. p. 160. ISBN 978-0719561061. ^ Samuels, Brian (March 18, 2013). "The History of the Bloody Mary". The Boys Club. Archived from the original on October 13, 2014. Retrieved August 30, 2018. ^ Shoffner, Robert (2008-07-01). "Here's to the Bloody Mary". The Washingtonian. Retrieved 2009-06-09. ^ Garbarino, Steve (21 May 2011). "The Bloody Mary Makeover". The Wall Street Journal. Retrieved 9 July 2011. ^ Cloake, Felicity. "How to make the perfect bloody mary". theguardian. The Guardian. Retrieved 9 November 2017. ^ a b Emen, Jake (Feb 16, 2016). "A Guide to the Bloody Mary and its Many Variations". Eater. Vox Media. Retrieved 9 November 2017. This article lists many variations. ^ "Ask OMC: Why do Bloodys come with beer chasers?". OnMilwaukee.com. Retrieved 2016-05-01. ^ "Bartending/Cocktails/Bloody Mary". WikiBooks. WikiMedia. Retrieved 9 November 2017. This page was last edited on 29 January 2019, at 03:39 (UTC).